Five Ways AI Will Change Relationship Management, Sales & Marketing. Industry leaders like you are searching for ways to capitalise on the true potential of artificial intelligence (AI); one of the most talked-about technologies of 2017. Bill Gates even referred to it as the holy grail of computer science. At Artesian, we want to cut through the noise and tell you exactly what AI is, where we're currently at in the evolution and why you should consider investing in AI. 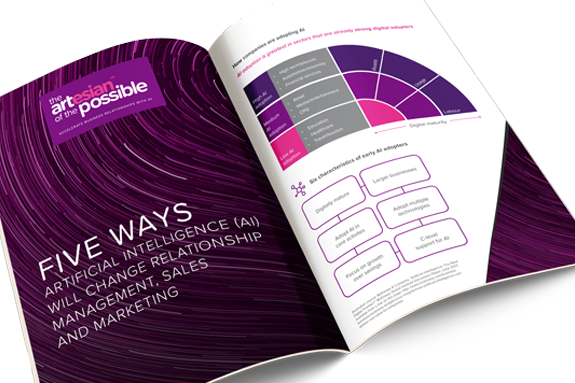 To do so, we've identified five ways in which we believe AI will change relationship management, sales and marketing. From more natural ways of interacting, to augmenting the buying and selling process, our paper has everything you need to know about the five key areas of AI innovation. These could help you to open new opportunities, enhance business applications and improve customer interactions. To learn more about the future of AI in sales, marketing and relationship management, as well as the impact it's having right now, enter your details to the right and we'll email this resource straight over to you. Interested in AI innovation and it's affects on relationship management? Request a demonstration of Artesian.